WALSH, Thomas James, a Senator from Montana; born at Two Rivers, Manitowoc County, Wis., June 12, 1859; attended the public schools; taught school; graduated from the law department of the University of Wisconsin at Madison in 1884; admitted to the bar in 1884 and commenced practice at Redfield, Dakota Territory; moved to Helena, Mont., in 1890 and continued the practice of law; unsuccessful candidate for election in 1906 to the Sixtieth Congress and in 1910 for the United States Senate; elected as a Democrat to the United States Senate in 1912; reelected in 1918, 1924, and 1930 and served from March 4, 1913, until his death; chairman, Committee on Mines and Mining (Sixty-third through Sixty-fifth Congresses), Committee on Pensions (Sixty-fifth Congress), Committee on the Disposition of Useless Executive Papers (Sixty-sixth Congress); died on March 2, 1933, on a train near Wilson, N.C., while en route to Washington, D.C., to accept the appointment as Attorney General in President Franklin D. Roosevelts Cabinet; funeral services were held in the Chamber of the United States Senate; interment in Resurrection Cemetery, Helena, Mont. American National Biography; Dictionary of American Biography; Bates, J. Leonard. 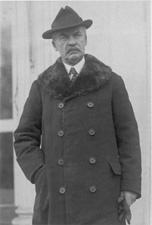 Senator Thomas J. Walsh of Montana: Law and Public Affairs, From TR to FDR. Urbana: University of Illinois Press, 1999.